Sourcing talent via social media requires an entirely different mindset than sourcing with other forms of human capital data, such as resumes/CV’s, employee directories, conference attendee lists, etc. Back in early 2009, one of only 2 guest posts ever co-written on my site was published on the topic of non-standard descriptors and the role they play in social media. Valerie Scarsellato was a Sr. Sourcer at Intel Corporation at the time when she put together the framework for the original article on sourcing via social media, and she has now moved into a Segment Marketing Specialist role at Intel and is loving it. For those of you who feel that employer marketing/branding/communications is a logical extension of sourcing, Valerie would wholeheartedly agree with you – check out this video in which she discussed her award winning _codehearted; work for Intel. Now that nearly 2 years has passed since the Searching Social Media Requires Outside-the-box Thinking article was published, social media usage has continued to explode – monthly visitors to LinkedIn and Facebook have doubled, they’ve nearly quadrupled for Twitter , and we now have Google+, Pinterest and others springing on the scene, making the topic even more relevant today. As such, I wanted to rework the original piece and update it with a few more examples. The primary challenge when leveraging social media for sourcing talent is that nonstandard terminology is prevalent – it’s generally acceptable to use slang and other verbiage that would otherwise never be found on a resume, even when it comes to describing one’s profession. 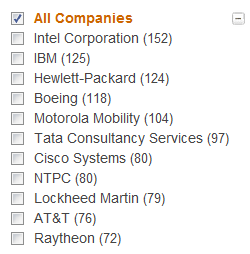 If you use the same query terms when sourcing LinkedIn, Facebook, Twitter, etc. as you would when searching for resumes, you will certainly find people. However, you will also exclude a decent portion of the available results, unknowingly relegating them to Dark Matter and otherwise undiscovered talent. This is because you can only retrieve what you explicitly search for. Social media and networking sites offer people a creative outlet that is free from restrictions on what is deemed to be “acceptable” when describing themselves and what they do for a living. In fact, it seems a decent number of people appreciate the opportunity to find cool and non-corporate ways to describe who they are and what they do. LinkedIn is “the” professional social network, and as such, a great many people do fill out their profiles as they would a resume. However, even on LinkedIn, you will find people that stray from the norm when it comes to titles and even company names. What I find particularly fascinating about sourcing via social media is that you have to begin to wonder what non-standard titles and terminology people might use. There is no list or guide, and you can only find what you search for. Discovering non-standard titles and terms is somewhat of an Easter-Egg hunt. 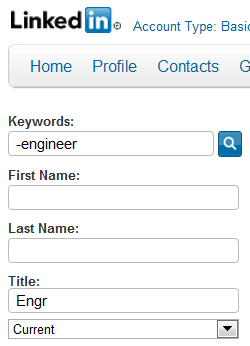 For example, as I was writing this post, I wondered if anyone abbreviated “engineer” into “engr” as a title on LinkedIn. Well, it’s obvious that some people do actually say “Engr” on their LinkedIn profile and also do NOT mention “engineer” anywhere on them. These are perfect examples of Dark Matter search results, as well as proof that even when sourcing LinkedIn, you are not safe in your assumption that people will only use standard terminology. 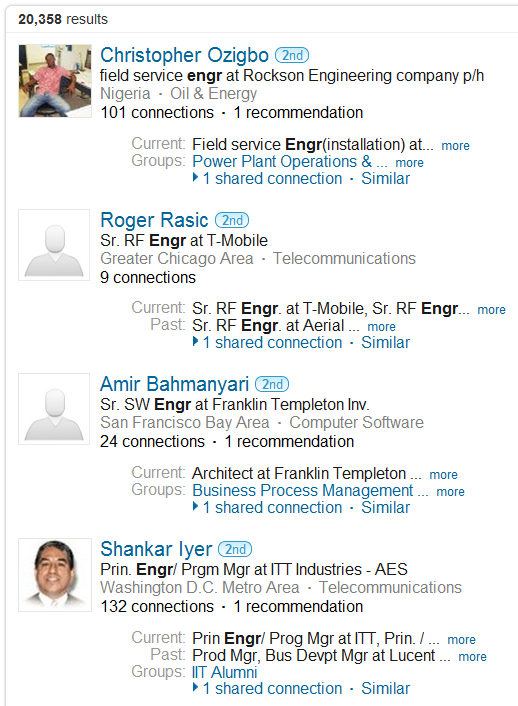 You would not likely find “Engineer” abbreviated to “Engr” on a resume, but unless you specifically search for [Engr -engineer] on LinkedIn, you will not find any of those 20,000+ profiles, quite simply because you can’t. How many more examples like this can we find? That’s what I love about this approach – the only limit is your “I wonder if” ability to hypothesize and explore. To illustrate the discovery of nonstandard terms, let’s start with another simple abbreviation. 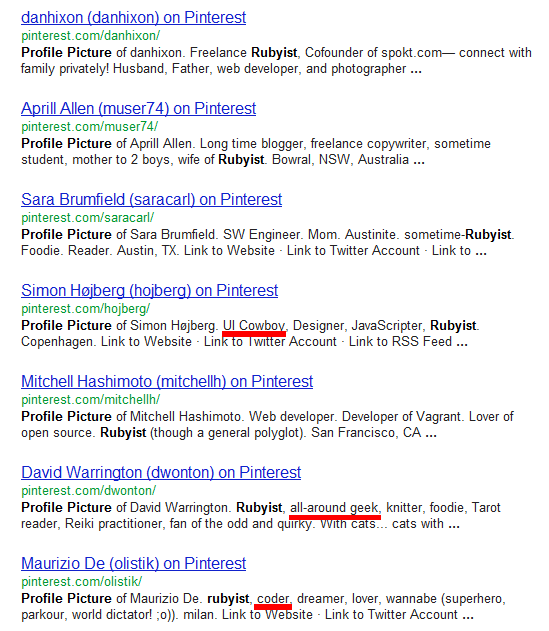 Instead of searching for “software engineer,” I decided to see if anyone used “sw engineer” instead. Again, not something terribly nonstandard, but certainly not something people would commonly use on a resume. More important than actually getting a result for “sw engineer” is noticing the reference to “sometime-Rubyist,” which alludes to Ruby-based software development. This illustrates how you can begin an investigative search process with an “I wonder if…” search that can lead to the discovery of more nonstandard references. 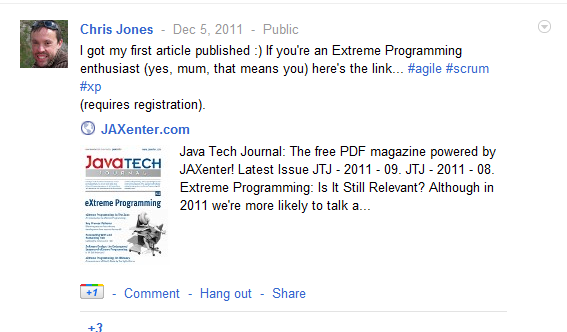 So you can see that this person mentions “enthusiast” and links to an article he wrote on Extreme Programming, and that Java is mentioned in the article. 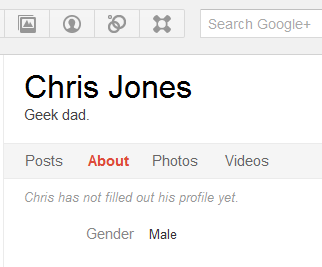 If you were searching Google+ for profiles of Java software engineers, you would not be able to find Chris by standard search terms. When it comes to resumes, most people will refer to themselves by industry-standard titles such as Programmer, Developer, Engineer, Marketer, etc. However, when it comes to Social Media, many people purposefully avoid “corporate” and resume-level descriptors and “tag” themselves using more informal language that results in a more personalized identity, rather than conforming to industry-standard job titles. For example, the computer programmer at work becomes “geek” or “tech nerd” in his/her Twitter bio. While these may not be considered “professional” descriptors, they are important to note in order to be able to effectively target and search for talent on social networking sites. As such, you will need to shift your way of thinking in the way we search for people, and you have to become open to non-standard descriptors such as “geek,” “nerd”, “techie,” “evangelist,” “droid,” “drone,” “junkie,” and “enthusiast” to name a few. 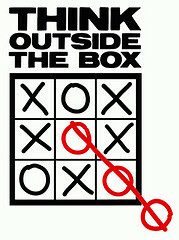 When it comes to Twitter, you will also need to think outside the box when it comes to sourcing talent in specific locations. Some people on Twitter can be quite creative when describing where they are from. Searching bios on Twitter will yield you nonstandard yet easily recognizable results such as Silicon Valley, Central New York, North NJ, Suburbs of Boston, NoCal, and Southern CA. However, some people take it a step further and utilize popular slang terms – for example: City of Angels, Big Apple, Bay area and Chi Town. There are the even more creative “tweeps” that want to remain mysterious, their location may be “Universe,” “Everywhere,” or “Narnia.” Perhaps even more intriguing is that some people simply list their latitude and longitude via their iPhones. When I clicked on her URL, I discovered that she is a software engineer. When I clicked on her URL, I discovered that she is a web designer. You simply could not find any of the above people using standard search terms. Save Your Nonstandard Search Terms! As you search for candidates using Social Media and uncover these non-standard descriptors, I recommend that you create a living document of search terms that are relevant to your hiring needs and profiles, taking special note of which ones may return the best results. While there is a lack of consistency in some of the non-standard descriptors, “geek” and “nerd” seem to be the new way to describe different flavors of technologists. You will also find that a good majority of these people will have a link to their personal blog, website or other social networking sites which may reveal a more detailed view of their professional focus, as can be seen in some of the results above. As I always say – anyone that’s easy for you to find is also easy for anyone else to find, including your competitors. Your goal should be to find everyone your competitors can find, as well as the people they cannot. I’ve illustrated a few simple examples of ways to uncover people who can’t be found using the standard search terms most people would use. It is important to note that the examples only scratch the surface, and it’s up to you to take the ball and run with it to discover more previously “unfindable” search results. I apologize to those of who who do not source/recruit in the I.T. space, but it is important to note that the examples I use are actually no less relevant to anyone sourcing for any other type of talent. It’s not the terms I am using that are important – it’s the thought, experimentation and discovery process. No matter what you source and recruit for, you can be guaranteed that a portion of the people will use nonstandard terminology on social networking sites when referring to themselves and what they do for a living. Its up to you to discover them. As social media continues to explode, the importance of thinking outside-the-box is critical in giving you a competitive advantage to find people that are there to be found and identified, but that most people simply cannot find because they search solely using standard/corporate terminology. If sourcing via social media sites such as Facebook, LinkedIn, Twitter, Google+, et al is a part of your talent identification and acquisition strategy, you MUST think outside of the box when choosing your search terms, or else you run the risk of unknowingly preventing yourself from finding all of the best talent available. Before you resort to garbage sifting on the Internet, I strongly suggest you make sure you have uncovered all of the available talent to be found on LinkedIn, Facebook, Twitter, and Google+. You can’t find everyone using standard search terms, and because of that, there are people to be found that you currently don’t and actually can’t. You just need to know HOW to find them.